The Storyteller was a popular fantasy TV series in the late 1980’s, created by Jim Henson and the Muppet Creature Shop. 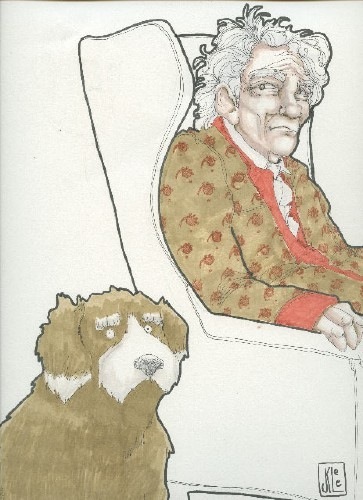 It featured John Hurt in the role of the Storyteller, simultaneously telling fantastic tales to his muppet dog (voiced by Brian Henson) and we the audience. Now, Archaia Entertainment brings us a brand-new Storyteller graphic novel in hardcover. It features new stories and artwork from numerous talented folk. Here’s a write-up from Comics Beat: “The Storyteller anthology will be edited by Nate Cosby, formerly of Marvel, with contributions by Roger Langridge, Jimmy Palmiotti and Justin Gray, Jeff Parker, Paul Tobin, Colleen Coover, Francesco Francavilla, Brian Clevinger, Tom Fowler, Marjorie Liu, Evan Shaner, Jennifer Meyer, Katie Cook, Chris Eliopoulos, Ron Marz, Jim McCann and Janet Lee — and an unpublished story by the late Anthony Minghella [who helped the late Jim Henson create the original series].” Look for it in September. For years we’ve been seeing sample art from the Ultraduck project showing up at San Diego Comic Con and other fannish events. 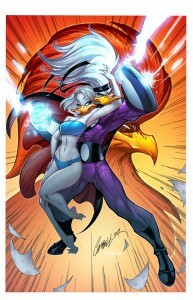 Now, it seems, Arcana Studios will finally be publishing the new Ultraduck graphic novel this October. It’s written by Edgar Delgado, with full-color art by Omar Lozano and Humberto Ramos. Here’s the basic description from Amazon: “Carlos, a regular duck living in the great city of Featherbay, just got dumped by his girlfriend, his life as a freelance do-it-all is going nowhere, and he must make some grown up decisions: to get a real job, get his girl back, and stop drinking. That is, until he gets super powers and becomes the only duck in the world who can stop a powerful creature who’s destroying the city on a vengeful rampage, and an evil weapons manufacturing corporation who wants his abilities.” Just how “anthro” is this project? Check out the promo art! The Six Crowns is a brand-new anthropomorphic fantasy novel series. It’s written by Allan Jones, illustrated by Gary Chalk, and published by Greenwillow Books. (In the UK, the series is known as Sundered Lands.) 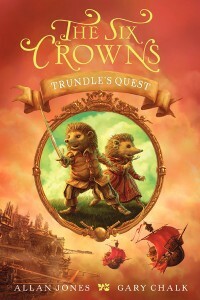 The first book in the series, Trundle’s Quest, introduces us to a humble yet ultimately heroic hedgehog. Here’s the publisher’s description from Amazon: “Trundle doesn’t think he’s an adventurer. He’s a lamplighter. He likes everything safe and cozy, and that’s the way things are in his peaceful part of the Sundered Lands. Until Esmeralda barrels through his door. Esmeralda, a princess with a knack for magic and for finding trouble, is convinced that Trundle is the only one who can help her find the six crowns. Lost and scattered long ago, the crowns could unite the Sundered Lands once again. But not if the pirates find them first. Suddenly, Trundle is on the run. He becomes a stowaway, a drifter, a thief’s accomplice, and a swordsman.Trundle may find that he is a true hero, after all . . . and that this is only the beginning of an epic journey.” Mr. Jones and Mr. Chalk also have a web site dedicated to the series. The Big Bad Wolf — or IS he…? 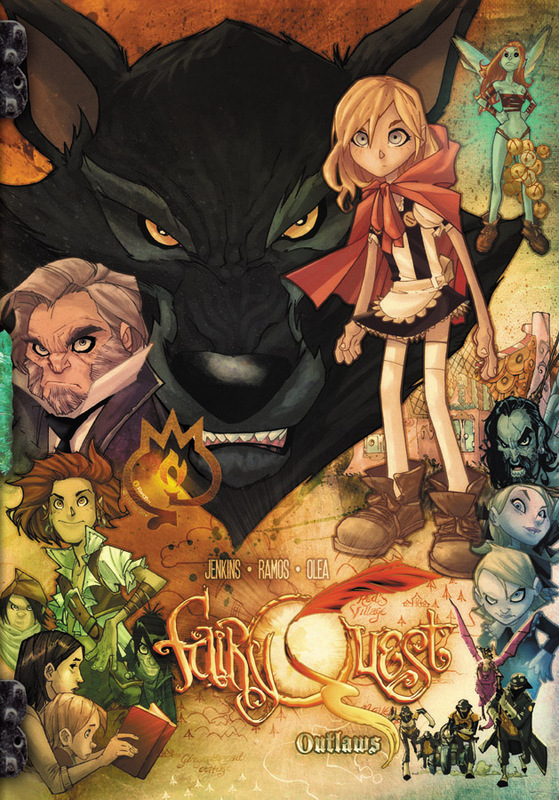 After literally years of struggling to find a publisher for their full-color graphic novel, writer Paul Jenkins and artists Humberto Ramos and Leonardo Olea decided to publish Fairy Quest: Outlaws themselves — and the result premiered at San Diego Comic Con this year. In the land of Fablewood, all the world’s favorite fairy tale characters re-live their famous stories over and over again, like puppets on a string. Then one day, Little Red and Mr. Woof decide they’ve grown tired of being enemies and decide to become friends — a little act of rebellion that turns all of Fablewood onto its ear, and brands these new friends as dangerous outlaws. 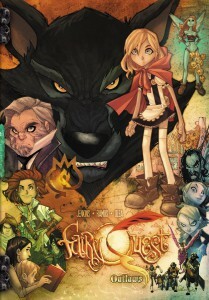 The web site Comic Book Resources has an interview with Humberto Ramos talking about the Fairy Quest project up on line. It’s envisioned as a four-book series. Admit it: At times it almost seems backwards to have a comic book based on a movie or TV series these days (as opposed to vice versa). But, here we go again: Image comics presents Teen Wolf: Bite Me, a full-color 3-issue mini-series based on the new Teen Wolf TV series on MTV. In case you need a re-cap, Scott McCall is a high-school athlete with a beautiful girlfriend and a future that’s looking up — until the night when he’s bitten by a werewolf. Now he not only has to deal with his frequent transformations, but also the fact that his girlfriend’s father is head of a local posse that has taken it upon themselves to hunt down and kill werewolves. In this new mini-series (written by David Tischman and illustrated by Stephen Mooney), Scott must deal with the new discovery that his “condition” may be incurable. Look for it this September. Elizabeth Hirst is a science fiction and fantasy author taking full advantage of the recent explosion of e-book publishing — stories on-line for purchase and download. 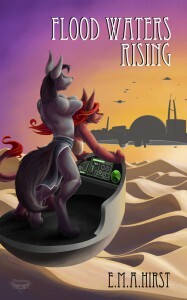 Several of her stories feature non-human creatures, and two recent e-novels are of particular interest to furry fans. Flood Waters Rising is a space opera starring members of an anthro-canine species. “Heir to a blood condition that can help heal the sick and even raise the dead, Sithon Flood finds himself trapped in a web of lies and manipulation at the hands of his stepfather, a tyrant who desires an undead army. Can Sithon escape Wardan’s evil schemes in time to save his parents’ lives and redeem his family name?” Then there’s Teddy Bear’s Picnic, in which a young boy named Deanie “wakes up one evening to see his favourite teddy bear, Jack, running into the woods, evidently alive. Deanie runs after him, thinking that the Teddy Bears’ Picnic he has heard about in stories had finally come to pass, but he is about to discover that not all children’s stories tell the truth”. You can find these and other works by Ms. Hirst at Smashwords, or at her publishing site. The well-known special effects house Digitial Domain is trying (once again) to start up its own animation house, this time in Florida. It’s dubbed the new studio Tradition — which is perhaps odd, as it will be working on CGI films, rather than the “traditional” hand-painted sort. Anyway, it’s been announced that Tradition’s first film will be called The Legend of Tembo, slated for release in 2014. 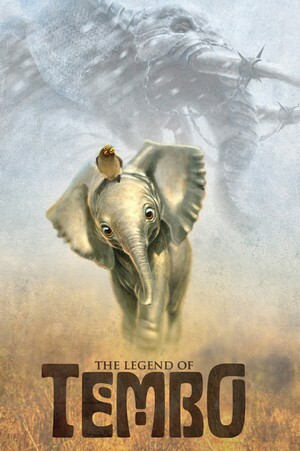 Directed by Disney veterans Aaron Blaise (Brother Bear) and Chuck Williams (Glago’s Guest), Tembo tells the story of an African elephant calf who is captured and taken to India — where he is trained to battle in a deadly war. We really can’t top this description (from Amazon) for The Trouble with Chickens: A J.J. Tully Mystery, so we’ll not try. “J.J. Tully is a former search-and rescue dog who is trying to enjoy his retirement after years of performing daring missions saving lives. So he’s not terribly impressed when two chicks named Dirt and Sugar (who look like popcorn on legs) and their chicken mom show up demanding his help to track down their missing siblings. Driven by the promise of a cheeseburger, J.J. begins to track down clues. Is Vince the Funnel hiding something? Are there dark forces at work—or is J.J. not smelling the evidence that’s right in front of him? 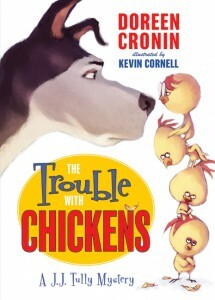 Bestselling author Doreen Cronin uses her deadpan humor to pitch-perfect effect in her first novel for young readers. Heavily illustrated with black-and-white artwork from Kevin Cornell, this new series is destined to become a classic.” It’s in hardcover from Balzer & Bray. The Amazon entry also features a video ad that Doreen Cronin put together for the book. Word has come out that a new stage show based on Dreamworks Animation’s award-winning How to Train Your Dragon film will be coming to Melbourne, Australia next March. The show features brand new characters, a brand new plot, and most interesting of all, full-sized free-walking audio-animatronic dragons. Here’s a quote from The Brisbane Times: “(There will be) at least 24 dragons for a show that will include acrobats and aerial artists, projections and flying creatures. The five-tier set will be backed by a 60-metre screen and the action will unfold on 1000 square metres of stage studded with projectors to provide an immersive experience”. There’s already a YouTube video of a press presentation that was recently held to advertise the show. It shows one of the dragons (a Deadly Nadder, in this case) interacting with a human.